Home › Blog › Mens Softball Season a Success! Mens Softball Season a Success! 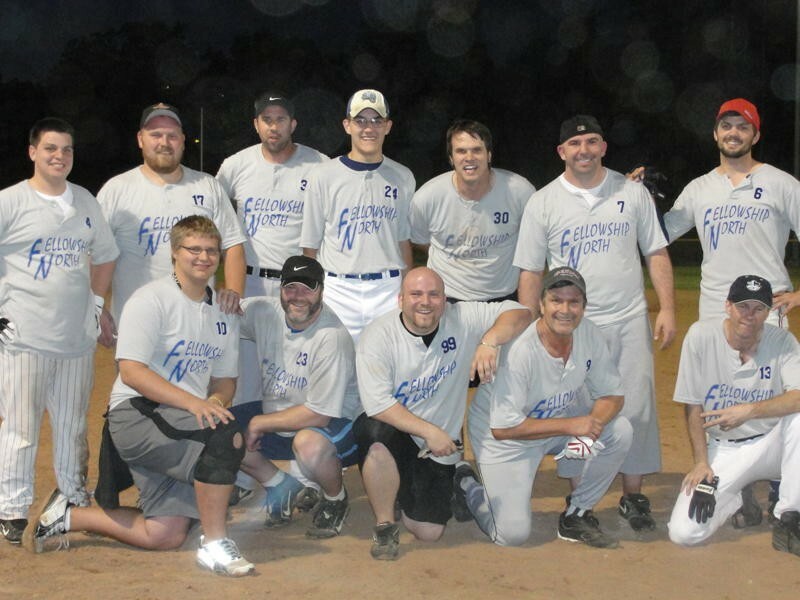 The Summer of 2010 meant a lot of different things to a lot of different people, but for 13 members and 2 guests, it meant the return to competition for a men’s softball team from Fellowship North. When we started, we had no idea what to expect as over half of the team had either never played softball, or hadn’t played in several years so our expectations of a winning season were lukewarm at best. After 3 or 4 fairly loose practices, we were ready to get the season started. Six straight wins later, we had thoughts of grandeur and a hint of overconfidence as we let the thought that should NEVER be thought in the world of teams sports creep into our heads: Could we really go undefeated? We were quickly brought back down to earth as 4 games later, our record sat at a more reasonable 7-3 and we were clinging on to 1st place in the division by the skin of our teeth. We composed ourselves, got a little healthy, and recovered to finish the season with 7 wins out of our last 8 games to end up at 14-4…1st place in our division by 2 full games. Now the thing to remember about softball is that it in no way resembles anything soft. Injuries was the underlying theme of our season as we had everything from pulled hamstrings, torn muscles, twisted ankles and even one torn ACL in the first inning of the first game. But the team always seemed to have somebody ready to step in and pick up the slack for our wounded warriors. If you ask any of the players, I can assure you that they would say it was all worth it as we got to play the game we love, while engaging in fellowship with other church members whom we would have probably never gotten to know if we hadn’t put this team together. Getting to know other members is always a good thing as there is a decent chance that it will lead you to an opportunity to serve God in ways that you wouldn’t have been introduced to normally, so if that was all we accomplished, it was worth every hard slide, blown call and major reconstructive surgery that we might have encountered along the way. I received several notes of appreciation from the many players regarding the formation of this team in which I answered every one with the sentiment that no thanks was necessary as I got as much or more out of the season than anybody and can’t wait to do it all again next year. I have no idea if the roster will be the same or take on a completely different look, but I am certain that we will give it our all and compete with the same amount of gusto that we had this year. One big difference though: expectations will be much higher coming off a first place finish so the pressure will be turned up a few notches…and we all know that there is no pressure quite like Church league softball pressure!! !